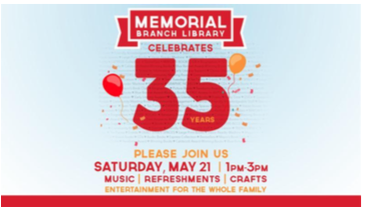 Memorial Library will be celebrating its 35th anniversary on Saturday, May 21. They will have music, refreshments, crafts and entertainment for the whole family from 1 pm to 3 pm. We helped them celebrate their 30th and now we will be there for their 35th which is our third Saturday stitch in. We meet at Memorial Library at 10:00 am. Let’s see how many of us can help them celebrate and thank the staff for the past five years of stitching. If you choose to stitch one of these projects it is truly a labor of love. A bulletin board I belong to is encouraging stitchers to try different methods of stitching a page on these full coverage designs. Similar to the stitch along but called a challenge– because it may not be how you normally stitch. The rules are: you can choose any piece you already own, the stitcher had to begin with a new page start, the page had to have a certain stitch count (mine has 7546 stitches), the page had to contain at least 5 colors (mine has over 20), the stitcher had to post a starting picture, a finished page picture and as many pictures as needed to demonstrate that the stitcher stitched one color at a time, oh, and each stitcher had two and a half months to complete the page. Yes, you read me correctly. Each color has to be stitched in its entirety for the page before you can move on to the next color. This is what is known as cross country stitching. Since I like to start with areas that have lots of solid color and jump around as I like; the hard part will be stitching all of one color before I can move on to the next color. It is interesting to see these pictures develop this way. I had some questions about this method of stitching. Do you start with the color that has the most stitches to it? Or do you start with any color you like? The one response I received was: pick a color that was all over the page and has good coverage. The benefit of this approach: you’ll have stitched a base color with at least a few stitches in each 10 by 10 grid of the pattern — these stitches will serve as placement guideposts to check placement for the remaining stitches on the page. The next step is to use the color that has the fewest stitches and work your way up to the color with the most stitches. Not sure which approach I will use but I will keep you posted. I’m curious… how would you approach this challenge? We are planning a road trip to the Schoolgirls Sampler Exhibit at the Pioneer Museum in Fredericksburg on Saturday, June 11, 2016. We will meet at the Park & Ride under IH10 and 1604 at 9:00 am. The museum opens at 10:00 am. We will probably stay 2 hours at the museum. Please let me know by phone 210-422-4770 or email at jjvandy@peoplepc.com if you are interested. We can all car pool and have a caravan on the way to Fredericksburg. Over 40 historic and contemporary schoolgirls samplers, thought only to provide girls a practical household skill, are viewed with modern research notes on their educational value in writing, reading, math, art, and geography in early American country schools. This Exhibit is co-hosted by Pioneer Museum and Friends of Gillespie County Country School to support the National Country School Association of America Conference theme: “On the Land—Learning at Hand” at the Pioneer Museum in Fredericksburg, TX. See www.CountrySchoolAssociation.org for more information. …one child at a time. It has been great watching all of the squares that our members have been working on during stitch-ins! 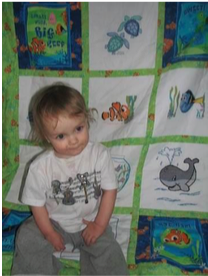 So far, one overachiever has already given me her completed square — so cute! Please bring your finished squares to any SANG meeting, class, or stitch-in throughout the year. I’ll be gathering them and will take care of mailing them on to Love Quilts USA after our November program. If you prefer, you could mail the squares to me, or mail them to Love Quilts USA directly – if you chose to send the squares yourself, please drop me an email to let me know that you donated a square — I’d love to keep a running total of all we do. Dues are due in May. 2017. You don’t have to be present to win. Maybe you will purchase the winning ticket from me. info can be found at egausa.org or in the March 2016 Needle Arts Magazine. If anyone has any bookmarks for the Region, please bring them to a stitch in before the first of June. A huge thank you to Mary Hodges for a fun and informative serger class! Reminder to let Pat know if you enjoyed the American Sampler Study Box and think we should do more. Pat would also like your input on whether we should do the projects from this and future boxes. It is that time of year again this is just a reminder that your annual dues are due this month. If you have already sent in your check for renewal, thank you. If you have not, there is still time to get dues in before the end of May, please mail them to Karin Shaw. Her address is on the membership coupon in this newsletter. I want to thank Mary Hodges for teaching our technique class in April Serger Class 201. If you are interested in getting involved why not teach a technique class or present a program. Many of you have your own areas of expertise in stitching and I think the guild could benefit from this knowledge. The Guild is always looking for new ideas, so if you’re interested contact Pat Sweet. I want to thank Pat Sweet, Diane Williams and Marilyn Veach for making our May Luncheon a success. A lot of work goes on behind the scenes and these lovely ladies do a fantastic job every time. I look forward to seeing those of you signed up for the Beaded Star class on May 14 and May 15. It will be from 9:30am – 4:00pm Saturday and 9:00am – 3:30pm Sunday, The Forum, 111 W. Nottingham. The deadline to join has passed for this event. June 15-18 SCR Seminar 2016 Boots and Bluebonnets will be held at the Westin Dallas Park Central, 12720 Merit Drive, Dallas, Texas 75251. For those of you signed up to go, I hope you have a good time and learn something new to share with the guild. 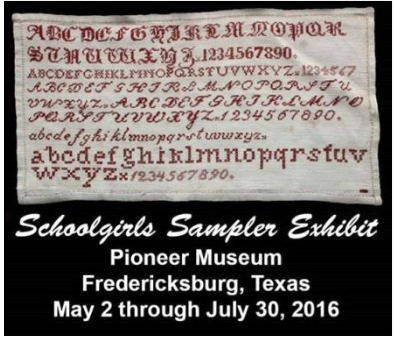 The Guild will be organizing a road trip on June 11 to go see the School Girl Sampler Exhibit in Fredericksburg. We will be meeting at VIA Park and Ride at 1604 and IH 10 to carpool. Please contact Joan Vanderbrink if you are interested in attending. Your nominating committee members are Joan Vanderbrink (board), Pat Sweet (day group), Joyce McCoig (day group), Beverly Moltz (night group), and Karin Shaw (night group). If you are interested in an office with the guild for the next two years please let one of the committee members know.